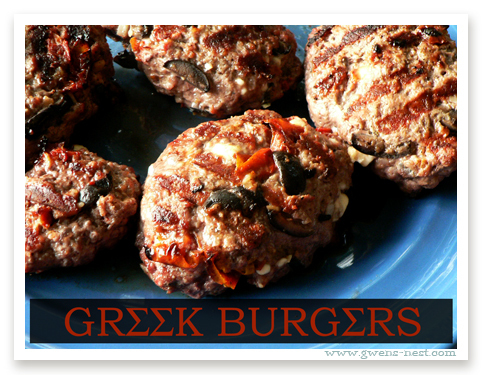 Grilled Greek Burgers are bursting with the amazing flavor blend of me Mediterranean: olives, feta cheese, and sundried tomatoes. SO good! Press ground beef out flat. I used my grilling tray, covered with foil, so I wouldn't have to wash a separate bowl. Press ingredients down into meat slightly. Fold meat in half over the fillings. Press out meat again, and fold over, repeating until ingredients are incorporated evenly through the meat. Or, you can toss everything into a bowl and mix it up...your call. Form patties into an oval or football shape, indenting the centers with your thumb. This will keep them flat while grilling! Zip together Tzatziki sauce to serve with your amazing Greek Burgers.